Each stage of work is fully documented to create a 12 page internal record. 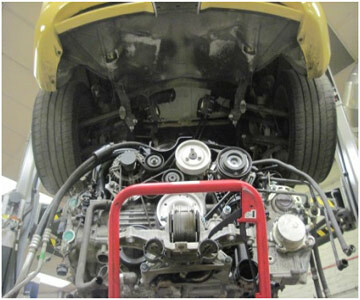 After an initial cosmetic check of the car we carry out a first assessment to satisfy ourselves ensure that there is an internal engine fault and that a re-build is necessary, (over the years we've had several cars arrive for re-builds but found early on that the faults lay elsewhere and have saved customers considerable unnecessary expense.) This may include oil analysis, cylinder bore imaging, DME analysis, combustion gas test, etc. 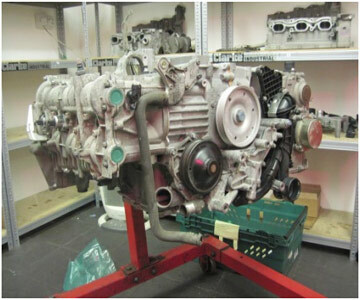 Once satisfied we remove the engine and gearbox as one unit then remove the ancillaries which get stored on pallets in our internal storage facility. 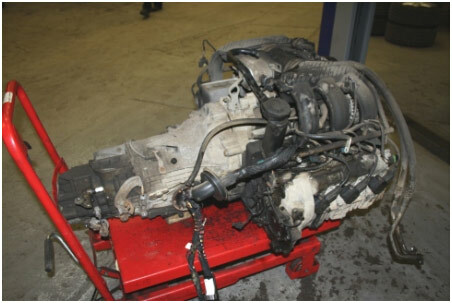 The "long motor" is then transferred to the engine team who strip and fully assess it. The picture below shows one engine stripped which takes up 2 bays of racking.The strip down room can accommodate 7 stripped engines. An internal meeting then follows to establish the "essential repair" elements, i.e. 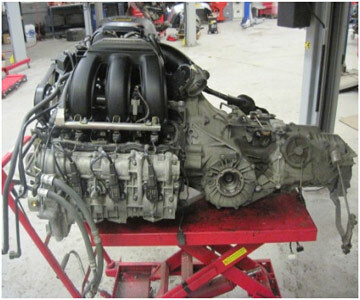 the minimum level of work needed to return the engine to a serviceable condition - this covers the initial fault and any areas needing imminent attention. We then turn our attention to other weak spots and identify further optional work to strengthen other areas of the engine which the customer may wish to consider. 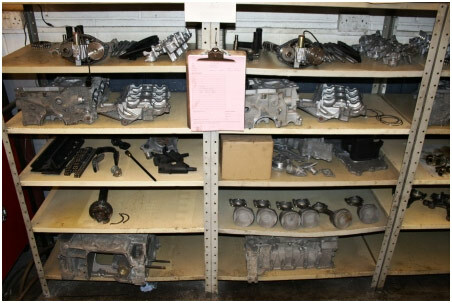 Typically this may cover a new intermediate shaft bearing, cylinder strengthening, new crank bearings, timing chains, cylinder head overhauls, pistons etc. We also look at other areas which are easier to address with the engine removed which may reduce the customers long term running costs. We use a spread sheet system to price up the various options then speak to the customer to discuss our findings and how to proceed. 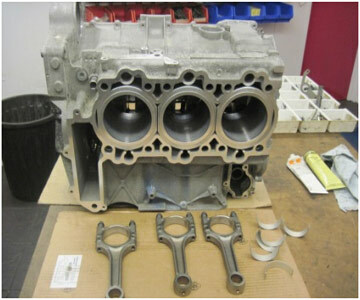 We can convey the information at all technical levels and discuss the engine at length so that even those with no mechanical knowledge are able to make informed decisions best to suit their situation and future plans for the car. The components then go through 3 separate cleaning processes and any necessary re-working in our precision in-house machine shop after which they're transferred to the assembly rooms. 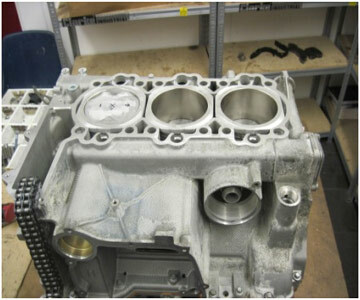 The engine is then re-assembled in our plastic lined "clean" rooms. These are deliberately away from our main workshop & engineering areas to avoid the fall out of typical workshops like dirt, metal cuttings, noise, distraction etc. 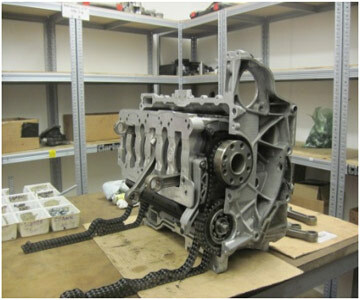 The assembled long motor is passed back to the workshop where the ancillaries are checked and re-fitted and then the engine & gearbox assembly is fitted to the car. Once running a thorough test program takes place involving at least 5 test drives with subsequent check over's. Internal engine test bed facilities are currently under construction to provide an additional test system.